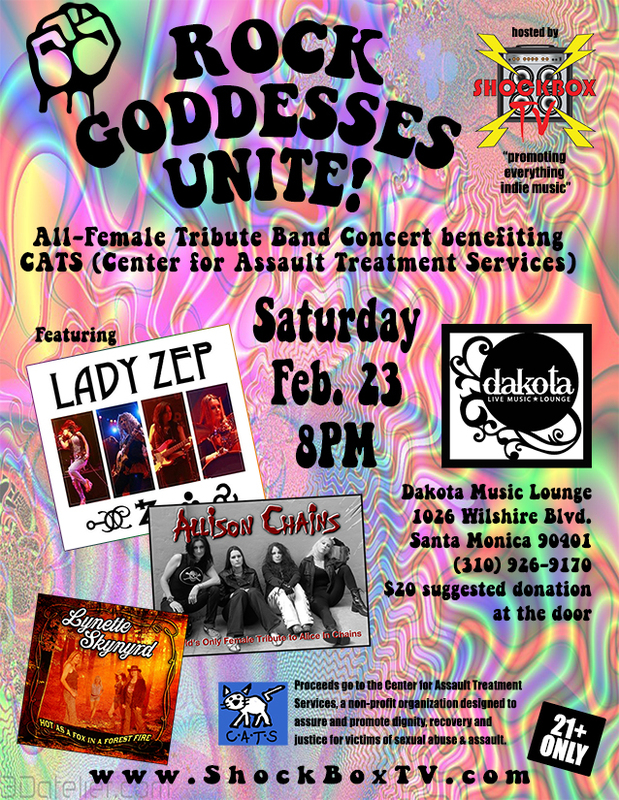 All-Female Tributes to Led Zeppelin + Alice in Chains + Lynyrd Skynyrd on Stage this Saturday, February 23rd. Only THREE DAYS to go until ROCK GODDESSES UNITE! at Dakota Music Lounge in Santa Monica to benefit the Los Angeles women’s and children’s non-profit organization, CATS (Center for Assault Treatment Services – CLICK HERE). If you are a fan of classic rock, live music, and supporting great causes (or any one of the three), do yourself a favor and check out our incredible lineup featuring the most talented “all-female” tributes to legendary bands Led Zeppelin, Lynyrd Skynyrd and Alice in Chains. THIS Saturday, February 23rd we will blow the roof off Dakota Music Lounge (CLICK HERE for info about this awesome venue). 100% of ticket sales from the show benefit the Center for Assault Treatment Services. Visit the event page on Facebook for more information by CLICKING HERE. We look forward to seeing you Saturday night!